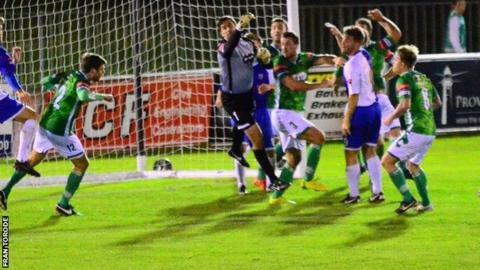 Guernsey FC failed to break down 10-man Herne Bay as they drew 0-0 with the Kent side at Footes Lane. The visitors had Samuel Hasler sent off after an hour, but Guernsey could not find a way past visiting goalkeeper Jack Delo as they went eighth in Isthmian League Division One South. "First half, I didn't think we did very well," manager Tony Vance said. "I thought we didn't penetrate, we slowed the game down at the wrong times and weren't dynamic enough." Guernsey's record-goalscorer Ross Allen will have to wait until Saturday's game against third-placed Dorking Wanderers to try and register his 200th goal for the club. "We didn't get bodies beyond Ross, so we played into their hands a little bit with that stiff wind," Vance added BBC Radio Guernsey. "It's very rare we get a 0-0, I don't particularly like them, they're a bit boring, but it's a point and we'll have to go again on Saturday - and be a little bit better as the team we're playing are flying."